Magic made Gateway the envy of the Known World, and now, magic must help rebuild a once great city that has been handcuffed and beaten into submission. 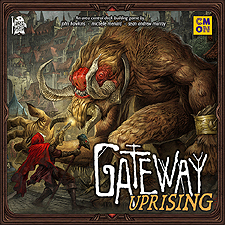 An authoritarian regime headed by Chancellor Gideon is ruling Gateway, while Monstrous Hordes threaten to destroy everything. Rebel Factions everywhere work to save the city from its doom. Gateway is a deckbuilding game where you start with a simple deck of cards and must, over successive rounds, recruit new Insurgent, Merchant, and Support cards to your Faction. Smartly creating their Deck allows players to build a strong and steady Army, ready to fight against Monsters and Guards for control of the city Districts.